The world is not short of sampling sequencers at the moment, so what does the Roland SP555 have to make it worthy of your attention? Ever since the SP202, the Roland/Boss SP range of workstations have been increasing the fun-factor of sampling by combining it with madcap effects, real-time controls, friendly pattern-sequencing and (not least) loads of pretty flashing lights. Despite jettisoning the family zero, the new SP555 otherwise follows very much in the footsteps of its forebears, providing the usual sampling, effects and sequencing functions, as well as chucking in a few nice little extras such as an infra-red D-Beam controlled synth/filter and a nifty on-the-fly Loop Capture facility. The SP555's primary sound generator is its sampler, which is controlled from a matrix of buttons at the right-hand side of the front panel. Each of the 16 large, numbered, velocity-sensitive pads plays a single mono or stereo sample. 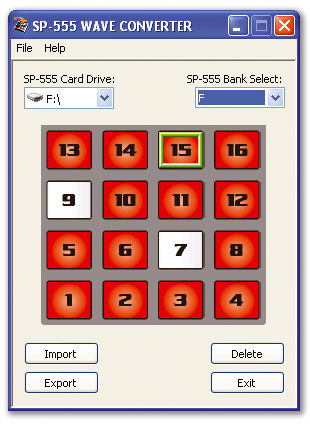 Switching between 10 pad banks multiplies the number of samples that can be accessed to 160, with 32 stored in internal memory and the rest carried on an optional Compact Flash card plugged into a slot on the front edge of the machine. Cards of up to 2GB capacity can be used, but no card is shipped with the machine as standard. The internal memory can hold 11 mono minutes at a 44.1kHz sampling rate, and given that you can get 48 minutes on a 128MB Compact Flash card, I presume this must mean there's about 32MB in there. Samples are data-compressed to make better use of the available storage space and, although I'm not a tremendous fan of data compression, the 2:1 compression routine used here sounds pretty good. What doesn't sound much good, though, is the Lo-fi sampling mode, which only takes up half the storage space but sounds really gritty. Apparently this grittiness is intented to simulate the sound of early digital devices, but there's no control over the Lo-fi data-reduction algorithm's parameters and, frankly, it just seemed to make everything I put through it sound broken! Given that you can have up to 160 stereo samples at your fingertips, the 12-voice polyphony isn't exactly lavish, and the manual informs me that this cuts down to a miserly four voices when you're using the built-in resampling. However, the unit's Loop Capture facility (of which more in a moment) allows you to work around this restriction and effectively resample even with all 12 voices going at once. Each sample has a few editable parameters, which can be reached via dedicated buttons. The file's playback start and end points, overall level and tempo can all be quickly adjusted, the last using a pretty respectable real-time beat-matching algorithm that offers pitch-locked stretching over a range of 50-130 percent. The accuracy of the beat-matching is made a little rough and ready, though, by a couple of tempo-resolution limitations inherent in the SP555's operating system. Firstly, the master tempo can only be set to exact bpm-value numbers and, although the range of available tempos covers 40-200bpm, there are only 26 options outside the 60-160bpm zone. Secondly, samples are automatically assigned an 'original tempo' value based on their length (not always the most reliable guide), and you can't edit this assigned value except to halve or double it. On the plus side, though, this approach does make dealing with simple loop samples very fast and simple. There are lots of ways to get sound into the SP555 for sampling. Rear-panel phono connectors will accept stereo line-level inputs, while mics and instruments make use of a top-panel combi jack/XLR connector. If you're short of a mic when inspiration strikes, there's a little one built into the top panel as well. The little switch alongside the combi socket lets you feed it with phantom power for using condenser mics, and also lets you switch it to a higher impedance, so that you can plug in electric guitars without quality loss. There's the risk, when delivering phantom power via this kind of socket, that the phantom will erroneously find its way onto the jack terminals, but my voltmeter confirmed that the SP555 manages, by clever internal design, to avoid this, even when the slide switch is in the Phantom On position. Top marks to Roland for thinking this one through properly. The rear of the SP555 accommodates all of the unit's I/O connections, with the exception of the headphone port and a jack/XLR combi input, which are found on the front and main panels respectively.Both mic and line inputs have separate level controls and on/off switches, and you can mix both inputs if you wish. There's no real level metering as such, but a Peak LED makes it possible at least to avoid clipping. If you're working on headphones and recording with just a microphone connected, you'll probably find, as I did, that you get various flavours of hum and interference on the mic signal. This is because the SP555 uses the same double-insulated construction as many consumer electronics products, and because the line-lump power supply doesn't supply an earth connection, the whole unit will be 'floating' electrically unless connected to another earthed unit. Simply earthing the metal front panel with a finger while recording was enough to sort the problem in my case, but Roland have also helpfully included a grounding terminal on the rear panel if you want to rig up a more permanent solution. There are two ways to sample on the SP555: using the Sampling button directly, or working via the Loop Capture facilities. The simple Sampling option is only really suited to capturing samples prior to building a track, as you can't record alongside the playback from other pads or even the built-in metronome (which will only give you a count-in). You just select whether you want mono or stereo and Hi-fi or Lo-fi sampling, and then start recording: you can either trigger the sampling manually or set up automatic triggering for when the signal exceeds an adjustable level threshold. MIDI In and Out sockets on the rear panel let you trigger your samples from an external MIDI controller or trigger an external sound module from the SP555's pads. The pads transmit and receive 80 different note numbers across your choice of two adjacent MIDI channels. 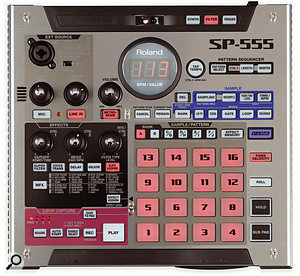 The rotary Effects controls will also send out MIDI Continuous Controllers, even though the SP555's effects block doesn't respond to MIDI messages at all. You can switch the MIDI Out to act as a Thru port if you wish. 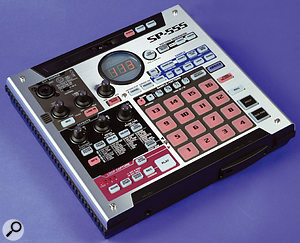 MIDI Clock and Song Position Pointers can synchronise the sequencer to other gear, and the SP555 can also transmit MIDI Clock at the global tempo. Loop Capture does almost everything that basic sampling does, without polyphony restrictions and in a much more useful way — the only slight limitation is that Loop Capture can only sample for 15 seconds in one go. Hit the Rec button in the Loop Capture area at any moment and the SP555 will start recording, assuming by default that you want a stereo recording of everything you can hear (except the metronome): mic and line inputs, sample playback and sounds from the D-Beam's synth option. Press Rec again to stop recording and then Play to hear what you've caught, before using the Save To Pad button to transfer it to a pad — at which point you can decide on the mono/stereo and Hi-fi/Lo-fi settings for the saved sample. If you want to add something else to the loop, hit Rec again to overdub on top of it (careful, though, because there's no Undo), or alternatively just delete it and record something else. All dead easy, and very quick — I particularly like the way you can record first and then decide on pad locations and sample formats later. My only real criticism is that it would have been nice to be able to transfer pad samples back into the Loop Capture memory for further overdubbing. This would also have enabled you to keep retrying an overdub until it was right. At the moment, if you overdub something wrong you have to re-start the Loop Capture process for another shot at it. The Measure button lets you automatically restrict the Loop Capture sample length to one, two or four bars, and Auto Start provides level-triggered sampling. Auto Start is really handy for quickly resampling individual pads (perhaps through the effects) and recording D-Beam synth riffs, although it tends to respond a bit late for things like drum loops/hits, even with the lowest level-threshold setting. The Source Select button lets you feed the Loop Capture section just from the mic/line inputs and D-Beam synth, which means that you can record ideas on the fly while pads are being played by the sequencer. Given that the D-Beam synth can't actually be controlled from the internal sequencer at all, Loop Capture is actually the best way to incorporate this in your programmed tracks. Another method of getting samples in is by importing them from WAV or AIFF files. Although there is a USB socket on the back of the machine, this doesn't provide access to the internal Compact Flash disk as an external drive (as you might expect), but actually allows you to use the SP555 as an audio and MIDI interface for your computer. (For more details, see the 'USB Audio & MIDI Interfacing' box, above.) This means that you have to have a separate Compact Flash card reader attached to your computer to transfer files. You can export SP555 samples too, and Roland include on a CD-ROM a little SP555 Wave Converter utility, which you can use to convert between the SP555's data-compressed audio and straight WAVs and AIFFs. The SP555's Wave Converter application lets you convert between the SP555's data-compressed audio and WAVs and AIFFs.Athough exporting files using SP555 Wave Converter worked fine for me, the SP555 became very temperamental as soon as I tried importing more than about four samples, either telling me that the card was unformatted or causing all the samples on the card to mysteriously evaporate. Importing lots of files direct from WAV format using the SP555's built-in conversion didn't create any problems, though, so I'd use that instead if you encounter problems with your particular Compact Flash card. Even if you plan on making all your samples yourself, I'd consider a card reader an essential purchase anyway, as that's the only practical way to back up your samples. If you are happy working with samples only in banks A and B, there is an onboard facility to back up just the internal memory to Compact Flash, but that means archiving your sample library on multiple Compact Flash cards. It strikes me as a better solution to store your samples in as many banks as you like, back up the internal memory to the Compact Flash card, and then back everything up via your computer to low-cost media such as CD-R. This machine has obvious live applications, and if you needed to run more than 160 samples for a live set, I'd suggest running a core set of general-purpose samples from banks A and B and then switching Compact Flash cards for different groups of songs, as necessary. You have to power down the unit to switch card, though, and I'd plan about 30 seconds for the switchover. The SP555's USB socket allows you to use it as an audio and MIDI interface for your PC or Mac. The included CD-ROM contains ASIO drivers that installed fine on my machine and gave me comfortably low audio latency even on my creaky old office PC. On the MIDI side, the SP555 transmits and receives via the USB cable exactly as it does over MIDI cables, and both worked fine for me in Cubase SX2. An LE version of Cakewalk's Sonar is bundled with the SP555 for any PC users who don't already have a suitable audio application. Audio from the computer can be sent directly to the SP555's audio outputs and headphone socket, or can alternatively pass through the internal effects on the way there. You can choose to send the main output mix from the SP555 to the computer for recording, but there's also a software switch that feeds the computer only from the mic and line inputs. If you're wanting to record while monitoring simultaneously via the SP555, you need to send only the mic/line inputs to the computer and disable software monitoring in your recording application, because the mic/line inputs are automatically routed to the SP555's outputs anyway. A nice touch is that you can then add monitor reverb using the SP555's internal effects if you like, as this doesn't affect the sound you're recording to the computer — very neat! Once the SP555 is loaded with samples, you can concentrate on performing with them and recording those performances using the onboard sequencer. Samples can be easily copied and exchanged between pads, to fall comfortably under your hands, and three levels of pad sensitivity help suit the feel to your playing style. If you don't fancy your playing skills, Fixed Velocity helps even out your playing by forcing all pad hits to the same user-defined strike velocity. For creating rapid-fire rhythms with a single sample, there's a Sub Pad that automatically assigns itself the same sample as the last pad you hit — which means you don't have to use up two pads to play the same sample with two hands. The Hold button defeats the Gate light for any pad you've got pressed, so you can set a loop or two going and then free your hands to riff over them with other phrase samples. 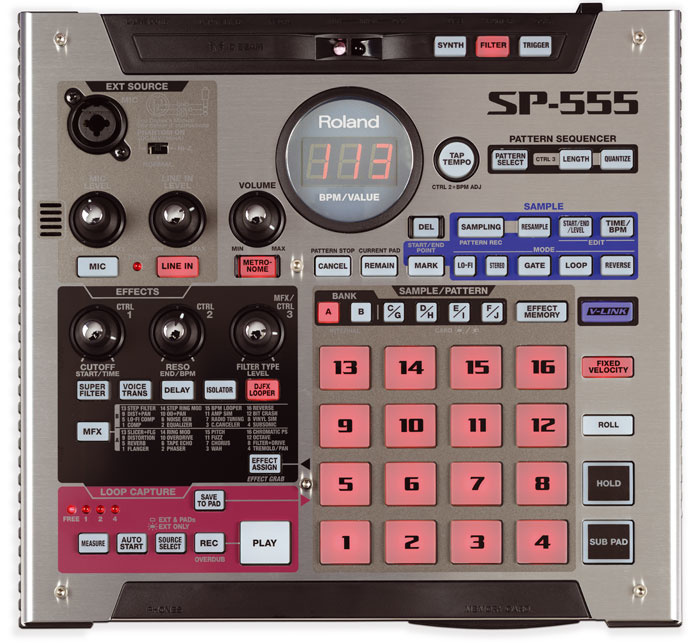 Forsaking the common menu-driven interface, the SP555's controls are all laid out in front of you on the main panel.The Roll button will be familiar to any Akai MPC user and many drum-machine owners besides, repeatedly retriggering any pad at a user-specified timing interval, from quarter notes to 32nd-note triplets. However, where many other units have aftertouch-sensitive pads with which you can modulate the volume of the roll as it progresses, the SP555's pads don't have this facility. Roland have worked around this hardware limitation by allowing the D-Beam to control the roll level instead. Recording your performances is a breeze, using the simple pattern-based sequencer. This gives you 160 patterns to play with, which are selected from the pads in much the same way samples are. Each pattern can be up to 99 bars long, but there's no choice of key signatures outside 4/4 and you can't set a separate tempo for each pattern. If you need a different tempo for each song, you'll have to enter it manually before playing the pattern, which is a pain. That said, what might ameliorate matters in practice is that holding the Tap button and pressing a pad automatically switches the global tempo to match the sample. Although there are two other methods of adjusting the tempo (using a controller knob or hitting the Tap button in time with playback), neither matches this approach for speed and accuracy. Once a pattern is recorded, it can be toggled on and off from its associated pad. If you press another pattern's pad while there is a pattern already playing, the SP555 will dutifully wait until the first pattern has come to an end and then seamlessly continue into the new pattern. Of course, if you want to defeat this you can hold down the Sub Pad button, whereupon any newly selected pattern triggers as soon as you hit its pad. Just as with the pads' sample assignments, it's easy to move patterns around to different pads to position them conveniently for performance purposes. 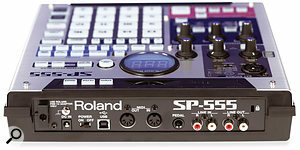 The SP555's D-Beam will be no stranger to anyone familiar with Roland's product range over the last few years. The two little LEDs on the top edge of the main panel send out jets of infra-red light which can detect the distance of any solid object, such as your hand, and use this information to play a built-in monosynth, control a multi-mode resonant filter, or trigger playback from a selected sample pad. The sensitivity of the D-Beam is affected by the ambient lighting conditions, but you can also adjust sensitivity manually if necessary. The monosynth offers eight preset sounds with eight preset delay effect settings (one, thankfully, a bypass option). You can choose from 21 different scale types, as well as offsetting the four-octave scale range by an octave either way. Controlling the pitch well enough to play accurate melodic riffs via the D-Beam isn't really an option, but that doesn't mean that there aren't a whole load of great swoops and noodlings to be had. If you're wishing that you had more access to the synth architecture, bear in mind that you can route the synth through the effects processor, which has more than enough sonic firepower to create a tremendous range of sounds from the eight presets. The filter has low-pass, high-pass and band-pass responses with four levels of resonance, and a fourth notch-filter response without adjustable resonance. These are fun for the usual clichés and smooth enough to avoid any obvious zippering, but there's not really much else to say about them. Triggering samples from the D-Beam seems a bit pointless to me when the pads are right there in front of you, but you also need to engage this mode if you want to adjust note velocities while using the pad Roll function, so I can imagine the Trigger button getting at least occasional use. As I often find with Roland gear, it's the effects that really steal the show. Despite what the buttons in the front-panel Effects section might lead you to believe, there is only one main effects processor in the SP555. This offers Super Filter, Voice Transformer (a formant-adjusting pitch-shifter), Delay, Isolator (a three-band frequency splitter) and DJFX Looper (chops up the audio into snippets: you set the length of snippet and its playback direction/speed/looping in real time) via dedicated buttons, as well as a further 32 multi-effect algorithms accessed from the MFX button. The MFX patches are all about character rather than fidelity, which is the right focus for a unit such as this, and include representatives from all the usual modulation, delay, reverb, dynamics and filtering categories, as well as funky special effects like octaving, amp simulation and various lo-fi grungifiers. Applying the effects to your samples is easy: press a pad and then press the appropriate effect button. To select one of the multi-effects algorithms, hold MFX and press a pad in bank A or B. This routes that pad's sample through the effect processor, whereupon you can bypass or switch effects using the Effects section buttons. Holding the Effect Assign button at the same time changes the button actions from latching to momentary, which is great for stuttering rhythmic changes. The Effect Assign button's normal role, however, is to allow you to route as many pads as you like through the effects processor simultaneously, and it also lets you send the mic/line inputs and D-Beam synth to the effects as well. Given the swift resampling capabilities already mentioned above, this much effects flexibility already offers enormous creative potential to the inquisitive user. But there's more. The three rotary controls in the Effects section provide access to three adjustable parameters per algorithm for real-time tweakery. What makes this now-common facility particularly cool, though, is that each algorithm seems to remember the last setting you chose for it, so you can dial in custom settings for all the algorithms before switching between them; the software parameters will only jump to match the physical control positions when you move them. Then there's the Effect Memory mode, where each of the 16 pads stores settings for an effects algorithm, allowing you to switch between wildly different effects settings rhythmically and without drop-outs. Where do I start in telling you how much fun this is? How about playing 16 different pitch-shift amounts? Or creating manual 16-level step-filtering? Or just choosing 16 different algorithms and locking yourself in some kind of audio asylum? Not since the Korg Kaoss Pad have I had such fun with an effects unit — pure inspiration! Now that I've got my breath back, there's just one final little nicety included: a switchable post-effect safety limiter. A lot of the more wild resonant effects, such as Super Filter, can generate pretty deadly signal peaks without much in the way of warning, and in a lot of cases it's better to be safe than sorry when you're feeding high-power speaker systems from the SP555's rear-panel phono line outputs. The limiter is also useful when working on headphones, as the headphone amp in the SP555 seems to be a fairly muscular specimen. The SP555 is a pretty straightforward unit to use, although the lack of a menu-driven operating system does mean that there are a lot of multi-button-press functions you need to remember if you want to get the best out of all the features. I'd advise photocopying the manual's four-page 'quick reference' guide and pinning it to your wall if you'd rather not keep riffling through the index. As a sampler, the SP555 lets you load and fire audio from a lot of different sources quickly, easily, reliably and with a decent level of quality. As a sequencer, it's no-frills, but it does what it does with the minimum of fuss. However, these facets of the machine are but a side-salad to the magnificent entrée that is the real-time effects implementation, which not only provides lots of spontaneous effects fun in a live context, but can also generate an endless stream of unique fills and breaks for dance/electronica productions and their derivative pop hybrids. In this UK price band there's direct competition from Akai's MPC500, at £399, which gives more polyphony and much more editing flexibility in the sampler and sequencer, via its LCD and menu-driven OS. The MPC500's effects, however, are to the SP555's what a tadpole is to a pike, and you don't get the onboard phantom-powered preamp. The Korg Electribe ESX1 also provides sampling, sequencing and creative effects, and since our review in SOS March 2004 it has come down in price to a more competitive £469. Again, this boasts far more features in the sampling and sequencing departments, but inevitably loses out somewhat in terms of ease of use. Also cast an eye over the rest of Roland's current range, to take in the SP404 and SP606, above and below the SP555 respectively in price. However, neither of these units appears to have quite the same facilities for real-time effects frolics. Clean-sounding and flexible analogue input options, with phantom power for decent condenser mics. Lightning-fast, on-the-fly sampling with Loop Capture. Bundled Cakewalk Sonar LE Audio + MIDI sequencing software. The most fun I've had with an effects processor since the Korg Kaoss Pad. No editing of pattern data in the sequencer. No Compact Flash card or USB lead shipped with the machine. Converting samples on a PC for use with the SP555 was buggy — better to use the unit's own conversion routine instead. I could take or leave the sampling and sequencing, but the effects in this new workstation are more fun than a box of whoopee cushions at the General Synod. Roland UK +44 (0)1792 702701.